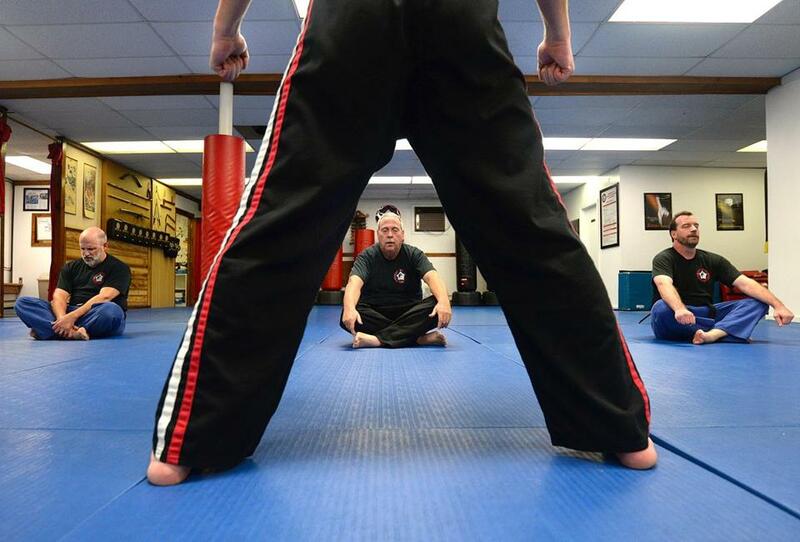 (From left to right) Victor DeRubeis and Brian Finnerty, both of Weymouth, and Jay Krim of Rockland meditating after their martial arts class, instructed by Chuck Anderson (foreground) at the American Kempo Karate Academy in Weymouth. I’ve never owned another minivan. In fact, I’ve downsized considerably. Fatherhood and advancing age, coupled with several recurring injuries, have exacted their toll, putting limitations on my time and my athletic pursuits. In short, I’ve needed to simplify. And I have plenty of company. “I gave up hockey about three years ago,” said Ken Beaulieu, 56, of Norfolk. “I was dealing with too many nagging injuries – groin, shoulder, elbow, back – and I was especially concerned about getting a concussion. Similarly, Freddy Cicerchia of Manchester-by-the-Sea said he had to “move on” from his love of team sports. A decade ago, Cicerchia was still running five times a week, but the wear on his joints required finding new pursuits. Like many of his contemporaries, Cicerchia didn’t change things up for financial reasons. The determining factors are typically time constraints and age-related issues. One of Cicerchia’s cycling partners, Terry Cowman, 64, also of Manchester-by-the-Sea, still races occasionally, but admits those starting-line conversations are different. 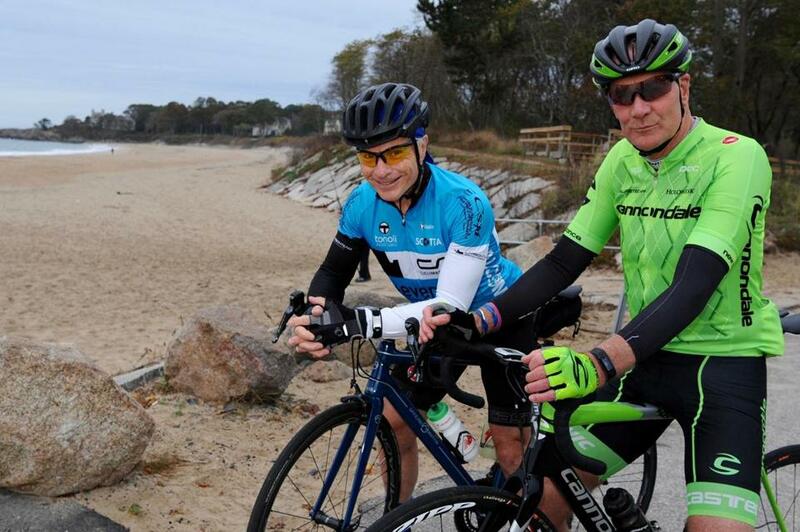 Freddy Cicerchia, left, and Terry Cowman, both of Manchester-by-the-Sea, at Singing Beach before a bike ride in late October. “The old guys compare ailments. We catch up on who isn’t there and why,” said Cowman. “In the old days, we’d talk about how under-trained we were. Times change. Lexington’s Marielle Yost, 53, was more of a late-bloomer, taking up running in her 30s. Despite running’s grind, she stayed with it, adding swimming and cycling and competing in triathlons. Things went sideways four years ago, when she suffered a torn meniscus in her right knee. To fill the void, Yost started taking power yoga classes, an alternative that more aging athletes are discovering. “It was especially easy on those dark, cold winter days, [since] I mostly work out in the morning at 5:30 during the week, due to work,” said Yost. “But come springtime, I wanted to go back outside. So I would swim outdoors and bike. But felt I needed something else. Since I love the water so much, I tried standup paddling, or SUP. “I still feel I get a good bang for my buck, having implemented yoga and standup paddling almost year round,” she said. 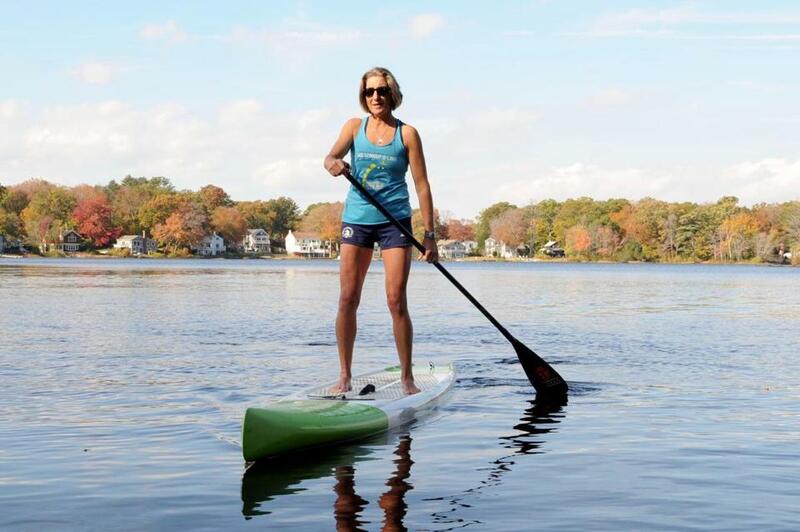 Marielle Yost of Lexington atop her paddle board on Chebacco Lake in Hamilton in late October. While many athletes enjoy a variety of pursuits, others pursue outlets that offer a complete body workout that incorporated the mind/body connection. Yoga and tai chi are popular options. 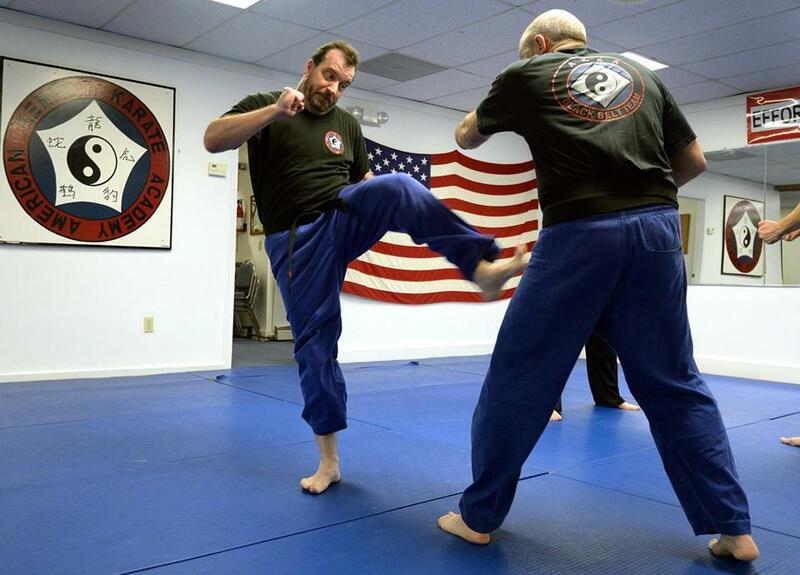 Rockland’s Jay Krim, 49, took up martial arts. Jay Krim making a move on Victor DeRubeis in class at the American Kempo Karate Academy in Weymouth. David Sarney, a 73-year-old runner from Braintree, gave up over-50 softball at 62 and over-40 basketball in his 40s, due to a change in priorities. He said running provides the best fitness benefit for the time commitment, even though his regimen was interrupted by a pair of pulmonary embolisms, at 53 and 63, and three ear operations. “I’m competitive, and have trouble comparing the ‘now’ me with the ‘was’ me,” said Sarney. “It’s important, if you’ve done these activities before, to forget about the ‘was’ me. Given the realities of aging, these athletes will accept simplifying. They won’t accept being sedentary.